Let’s get literal here: butter + finger. Never-mind, let’s keep it metaphorical: butterfinger. 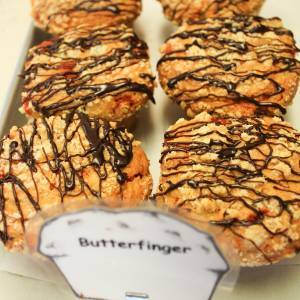 Where butter equals all delicious ingredients in any baked good and muffin equals its current form, finger must then equal the method of consumption i.e. by holding/grabbing/pinching with fingers into the mouth one bite or muffin at a time. Even if this could be prove wrong, who in their right mind would want to be right!